Okay, so you want to dress up as a Green Bay Packer football player for obvious reasons. The Green Bay team is loaded with skilled athletes who can squeeze into the opposing team's end zone while blocking the quarterback from a devastating sack. If you want to look like one of these talented athletes, you may think you need to wear binding football pants and a bunch of bulky shoulder pads, but there's actually a way more comfortable way to suit up! Instead of getting into a tight costume, wear this uniform comfy throw instead. 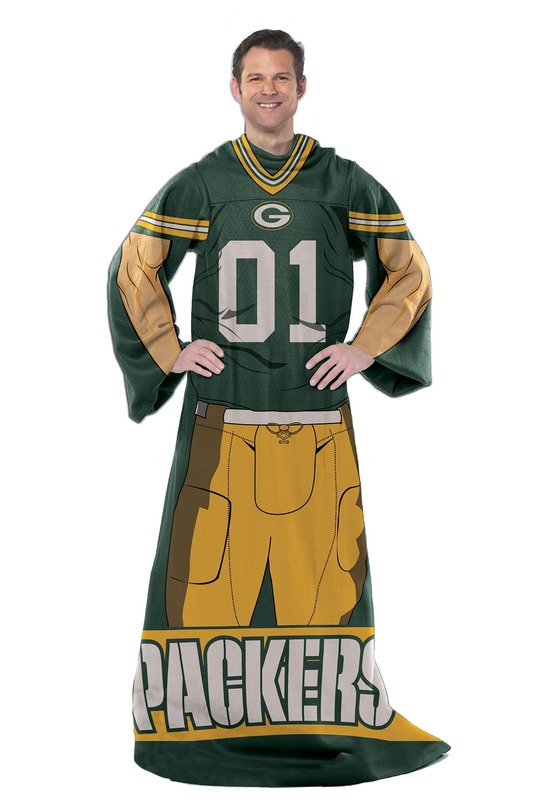 Printed to look exactly like a Green Bay packer uniform, this sleeved blanket is made from soft fleece and it's far from binding. It's oversized so it fits all shapes and sizes and it's big enough so you can wear your own clothing underneath so you're as comfortable as possible while you're out celebrating Halloween festivities!